Here I've gathered a few of my favourite places in one of my favourite cities on earth; Rome. Even though I've visited hundreds of times by now I would never call myself an expert when it comes to these things. Everything changes constantly and it's hard to keep up but for now, these are a few little gems I'm happy to return to. I honestly feel like Rome is a great city to visit no matter the time of the year. Well, maybe July and August can be a little bit intense since the temperatures goes really high and it can be a bit unbearable without any water close by… Having said that, I went to Rome almost every single summer during many years and even though it could be burning hot, I loved visiting anyway. My tip for this super hot season? Wake up early, go out and explore, have lunch and then head back home to your air-conditioned room for a little siesta before heading out again in the evening. Or you could avoid this problem all together and visit during a cooler period. I personally love spring and autumn in Rome and it’s always nice to get a little peek of what warm weather feels like when it’s colder where you live. And sometimes when I visited in November, it was still warm enough to just wear a t-shirt and you can pretend like winter is not on its way already! Ahhh, so lovely. The best way to get into the city is either by taxi or by taking the train. The train costs around 15€ per person if I remember correctly and is really easy to find and take. It goes all the way into Rome’s central station called “Termini”, about a 40 minutes trip from the airport. The trains are quite new and even have wifi most of the time! Pretty impressive for being Italy I would say. The taxi should be something around 48€ (they do have a flat rate for this trip during certain hours of the day). Once in the city, I would recommend walking. Walking is such a great way to see the city and you can probably see most sights by walk in a day or two! Another incredible way to see Rome is by Vespa, either renting your own (if you’re comfortable with the Roman traffic that is) or by hopping on the back of a Vespa together with Scooteroma Tours. If you’re heading to a restaurant, back to the airport or somewhere in the city and just don’t feel like walking, you can also take a taxi of course. Although they can be a bit tricky to find and I don’t have a good suggestion for a taxi app or something similar unfortunately. Dress however you want to dress but the cobblestoned streets in Rome can be a bit tricky to manoeuvre in heels, just so you know. I’ve done it and made it out alive, haha! But I have to admit that it was a pretty tricky walk. The roads are quite badly maintained and you can all of the sudden find yourself stepping into a giant hole in the middle of the street so I would most definitely recommend to bring a pair of comfortable shoes due to the street quality if you want to do some walking while in Rome (which you very much should). If there’s one place I always come back to, over and over again, it’s Santa Lucia. Best time to come is during warmer days so that you can enjoy their beautiful terrace outside. Prosecco and meatballs with a classic tomato pasta is something I’ll never leave without. Largo Febo, 12, Rome. As simple as it gets but absolutely delicious at the same time. Super thin pizza, served on metal plates while sitting on plastic chairs with paper table cloths – Italy summed up in a few words. 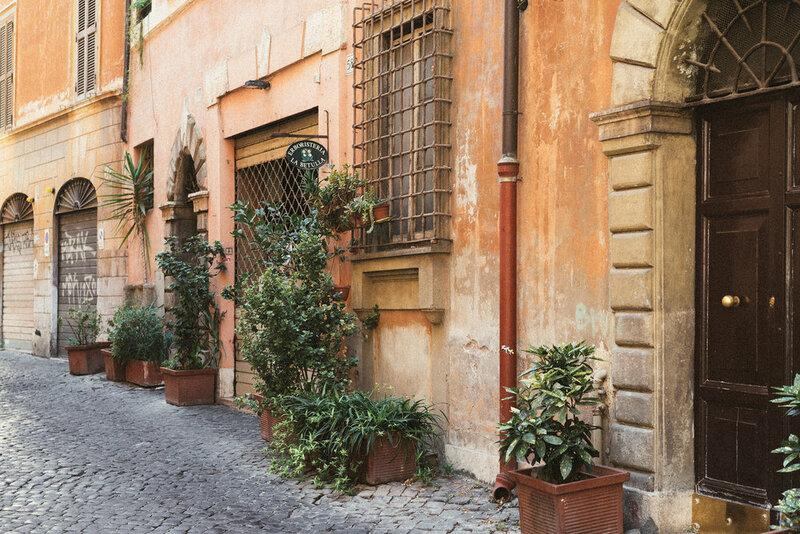 Vicolo Savelli, 13, Rome. One of my favourite restaurants in Rome that serves up classic Italian dishes in a modern way. I love sitting at the bar, ordering small dishes to share (the aubergine fritters, aubergine pie and the classic tomato spaghetti are a few gems) along with a bottle of delicious wine. Via delle Zoccolette, 22, Rome. Classic Italian trattoria, which to be honest, doesn’t offer much of a trendy/modern atmosphere but their food certainly makes up for it. Their dessert selection, including traditional pies and tarts, are just to die for. Via di Gesù e Maria, 18, Rome. Simple, busy but everything you need when it comes to a good pasta. Drop by and ask the owner (who’s almost always standing outside) about a table for later. Go have a drink at Bar del Fico and come back for a great pizza or a pasta bolognese when the time is right. Piazza del Fico, 29, Rome. On a quiet street I stumbled upon Giulio Passami l’Olio during a holiday with my friends. I would go back for their yummy lasagna and their charming little terrace in the spring and summer. Via di Monte Giordano, 28, Rome. I visited this place for the very first time years ago when it was just a little hole in the wall. Today they’ve taken over the space next door to the original restaurant as well and are serving up their famous trappezzino sandwiches and delicious suppli (and even explained to New York!). Perfect street food. Via Giovanni Branca, 88, Rome. Grab fried zucchini flowers to go (almost as good as French fries), suppli or a couple of pizza slices to go. Central, quick, easy and devious makes this a great place for a little stop on the go. Via della Pace, 27A, Rome. If you against all odds get tired of the pasta and the pizza, Ginger could be an option for smoothies, salads and juices. Italian haven’t really mastered the art of delicious food that isn’t pasta or pizza but this is an option anyway. Via Borgognona, 43-46, Rome. Apparently Obama ate here while in Rome, which I guess can explain why it can be a little bit hard to just walk in for a table. Piazza delle Coppelle, 44, Rome. Speak-easy bar, delicious food, lovely atmosphere and great cocktails all in one. I love sharing a bottle of wine on their outdoor terrace, enjoy a delicious dinner (the pasta carbonara is the bomb) or sneak into the very charming speak-easy bar while in town. Piazza delle Coppelle, 55/56/57. In one of my favourite areas, Monti, you’ll find La Taverna de Fori Imperiali. Even though many tourists have found this spot by now, I always return for a good plate of pasta. Via della Madonna dei Monti, 9, Rome. During lunch-time you’ll rub elbows with nicely dressed Italian men, having their lunch break here before getting back to work. If they still have the salmon pasta on the menu, that’s a safe bet. Via di S. Nicola da Tolentino, 26, Rome. For any suppli lover (fried rice balls with cheese inside) this is a dream. Via dei Banchi Vecchi, 143, Rome. Overnight this place has become incredibly famous and now you most likely have to wait in line for an hour to get a table. Is it worth it? I’m not entirely sure but they do serve some delicious traditional pastas in a very simple yet charming Italian environment, nestled among the little streets of Trastevere. Via dei Vascellari, 29, Rome. A cute little café, located just a stone’s throw away from the Trevi Fountain. Via Poli, 27, Rome. I have to say that I haven’t found many places in Rome that can serve up an American or English breakfast in a proper way. I can’t say that Buvette does this flawlessly but after a few weeks in the city I tend to crave eggs or something different that a pastry for breakfast. Via Vittoria, 44, Rome. On sunnier days their little terrace makes for the perfect cappuccino pause or breakfast place before continuing on. Via di Panico, 28, Rome. Simple and traditional little café where I always make a little stop in the morning for a cappuccino and a “cornetto con nutella”. Yum! Piazza di S. Lorenzo in Lucina, 29, Rome. Favourite gelateria in Rome must be Come il Latte. A little bit off when it comes to the location but it’s definitely worth it. I always go for the nocciola (hazelnut) of course. 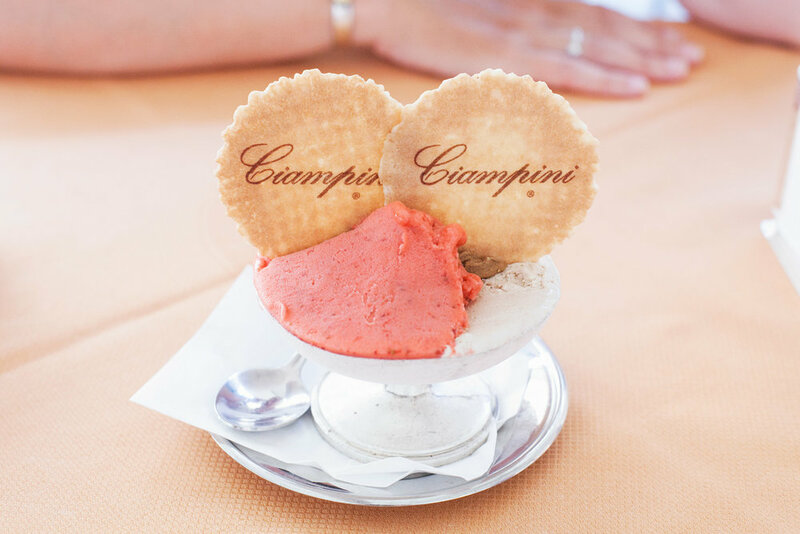 Other ice cream favourites include Fatamorgana, Frigidarium and Ciampini. If I could dream, I would always stay at Hotel Eden. Period. The staff is just the friendliest, the hotel is completely renovated and the rooms are gorgeous (I’m sure you’ve seen their incredible bathrooms by now). Home away from home in Rome. During warmer times I always go to Hotel de Russie for a drink in their beautiful courtyard. It’s the perfect place to have a spritz or a glass of prosecco at before continuing the night somewhere else, to celebrate a special event or to share a little romantic moment together with someone special. When it gets warm outside Bar del Fico bar takes up the entire square outside with people chatting, sipping spritz and nibbling the apero dishes the bar puts out for free along with your drinks. The atmosphere is almost always luring me in! 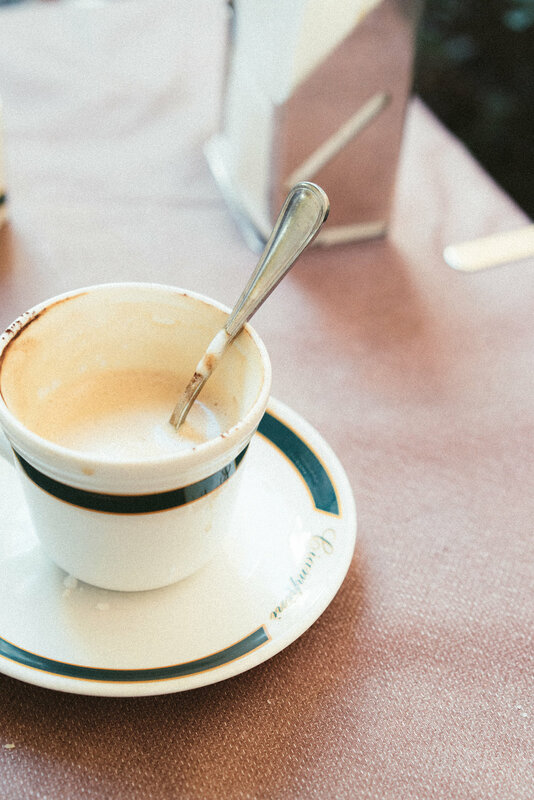 A few places to get a drink while in the city would be Caffè Peru (the square fills up quickly when temperatures get higher), Borgo Ripa (their garden is just to die for), Barnum Cafe (coffee during the days and drinks during the evenings). If you want to see Rome but don’t have a lot of time – or even if you’ve been to Rome 20 times before but just want to see the city in a different way – I can’t recommend booking a tour with Scooteroma Tours enough. Chose the tour that suits your likes the best and enjoy every single second. Another favourite place to visit while in the Italian capital is for me Giardino degli Aranci. It's a beautiful garden with a gorgeous view of the city. The direct translation means "The Garden of Oranges".